Christmas has come and gone, and the answer to who ate all the pies is finally clear. It was me… I ate all the pies, well one pie, just a really big one. The trouble is that getting fit is hard, just getting up and going to the gym in the first place takes effort. Thankfully there is a brand-new fitness regime coming to rescue us all from ourselves, and it’s on the Nintendo Switch. Fitness and gaming aren’t exactly natural bedfellows. Nevertheless, we have had a few attempts in the last few years - remember the Wii Fit? 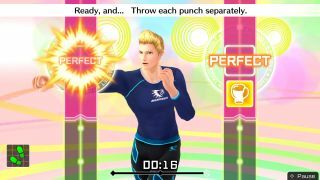 Fitness Boxing is the latest in the strange sub-genre of fitness games. It has a virtual trainer telling you what to do and when, you can even choose who you want to train you for that extra personal feel. As a personal trainer, I’ve been training both myself and other people for years, and it is rare that one of these games genuinely feels like a workout. More often than not they might be challenging (balancing on the Wii Fit board was tough work) but it will never get you working up a sweat. A good workout should push you. If it doesn’t challenge you, it won’t change you (so the saying goes in the fitness circles). A good workout should really test your limits, it should make you wish for the end. After, you should feel all warm and fuzzy – probably a little gross too – as well as full of them good hormones. After all, without some kind of positive feeling afterwards you’re unlikely to actually stick to the program. The trouble is that most fitness games are more likely to leave you bored and sweatless. This is not the case with Fitness Boxing, the workouts are actually pretty challenging, even on the lowest difficulty you’ll find yourself watching the clock tick down and wondering when the weird renditions will end. The exercises start off as just throwing basic jabs and straights, but escalate pretty quickly. Before you get to the hard stuff, the game takes you through some stretches to make sure you are ready to go. The instructor gives clear explanations for everything you need to do. The default setting for them is to be a mirror image. This makes things really easy to follow along with, though you can change it if you don’t like it. The virtual instructors are all a little more robotic than most personal trainers, but there is a weird charm to the slightly Siri-esque delivery of instructions that makes them easy to listen to. On the subject of the instructor, you’ll be happy to know that they are all fully customizable. There are six different ones to choose from, from the ridiculously hench, to the incredibly lithe, you have plenty of options. You can even change their eye, hair, and skin color. All a little bit weird, but much better than having to look at the same boring real-life persona trainer. You unlock new clothes for them by hitting certain milestones, so you can have the waifu or husbando of your dreams telling you to work harder. The training itself is simple enough, all you have to do is keep bouncing in your stance and throwing punches to the beat. Initially it is just the occasional punch here and there, but each completed workout nets you new things. Unlocking new songs means having harder workouts, the songs themselves are stripped down versions of pop songs, not offensive at least. The progression feels pretty good and helps to keep you challenging the next workout with gusto. Though this is all with the daily workout. Things get a little more free-form in free training. Free training lets you pick single or multi-player to start with, just in case you want to feel silly and sweat it out with someone else. You can then choose a song to workout to – each of which is a weird instrumental version of a well-known song – or you can choose a workout based on what area you want to hit. With the songs, you can even choose to do a normal speed or a faster version if you want a challenge. The faster versions are pretty funny as the instructor speeds up too, leading to incredibly fast Gilmore Girls speed talking. The sheer level of customization means you can really control how you get fitter. It is much easier to stick to a workout plan when you have the option to choose how long you are training for. The whole thing is incredibly thorough, with every part mapped out and no horrible difficulty spikes, which your body will appreciate. The constant stream of unlocks helps a lot as well. As you reach the different milestones different instructors will get new clothes to try on, you’ll unlock more songs, and most importantly, you’ll get to the more complicated workouts. When it gets to the more complex stuff, it helps that there is a really comprehensive practice mode if you find you’re struggling with a particular motion, perfect for those with bad coordination. The whole thing is a genuinely effective training program. I can honestly say I would recommend it to my clients as a workout for those days when reaching the gym just isn’t going to happen. It would also be a fantastic way of complimenting any weight training regime. Plus, you can always just pause the game if it is getting too much, something that is never an option with a PT in front of you. You will definitely get fitter if you follow it all along. Just be aware that if you get sweaty palms, you may end up needing new Joy-Cons.